ExpertGPS is GPS map software for your Windows computer or laptop. ExpertGPS makes it easy to transfer waypoints, routes, and tracks, as well as GPS, GIS, and CAD data, to and from your Garmin nüvi GPS. All Garmin nüvi 30 GPS receivers are supported in ExpertGPS. All Garmin nüvi 40 GPS receivers are supported in ExpertGPS. All Garmin nüvi 50 GPS receivers are supported in ExpertGPS. All Garmin nüvi 60 GPS receivers are supported in ExpertGPS. 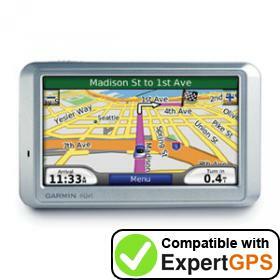 All Garmin nüvi 200 GPS receivers are supported in ExpertGPS. All Garmin nüvi 300 GPS receivers are supported in ExpertGPS. All Garmin nüvi 400 GPS receivers are supported in ExpertGPS. All Garmin nüvi 500 GPS receivers are supported in ExpertGPS. All Garmin nüvi 600 GPS receivers are supported in ExpertGPS. All Garmin nüvi 700 GPS receivers are supported in ExpertGPS. All Garmin nüvi 800 GPS receivers are supported in ExpertGPS. All Garmin nüvi 900 GPS receivers are supported in ExpertGPS. All Garmin nüvi 1100 GPS receivers are supported in ExpertGPS. All Garmin nüvi 1200 GPS receivers are supported in ExpertGPS. All Garmin nüvi 1300 GPS receivers are supported in ExpertGPS. All Garmin nüvi 1400 GPS receivers are supported in ExpertGPS. All Garmin nüvi 1600 GPS receivers are supported in ExpertGPS. 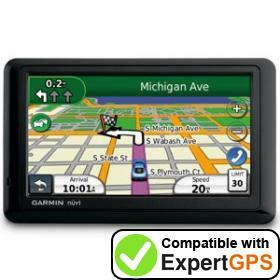 All Garmin nüvi 2200 GPS receivers are supported in ExpertGPS. All Garmin nüvi 2300 GPS receivers are supported in ExpertGPS. All Garmin nüvi 2400 GPS receivers are supported in ExpertGPS. All Garmin nüvi 2500 GPS receivers are supported in ExpertGPS. All Garmin nüvi 2600 GPS receivers are supported in ExpertGPS. All Garmin nüvi 2700 GPS receivers are supported in ExpertGPS. All Garmin nüvi 3400 GPS receivers are supported in ExpertGPS. All Garmin nüvi 3500 GPS receivers are supported in ExpertGPS. All Garmin nüvi 3700 GPS receivers are supported in ExpertGPS. All Garmin nüvi 5000 GPS receivers are supported in ExpertGPS. Don't see your Garmin nüvi GPS on the list? Select the closest match in ExpertGPS, or send us an email and we'll add it to this list!